I've developed modelling tools for the analysis of progressive crowd collapse due to�persistent standing in seated areas at football matches (Premier League Project). The modelling suite allows me to construct 3 dimensional areas (stands) and experiment with varying the seat depth, height, spacing, demographics and slopes. Basically, this is crash test dummies for crowds. The prototype tool is shown below. 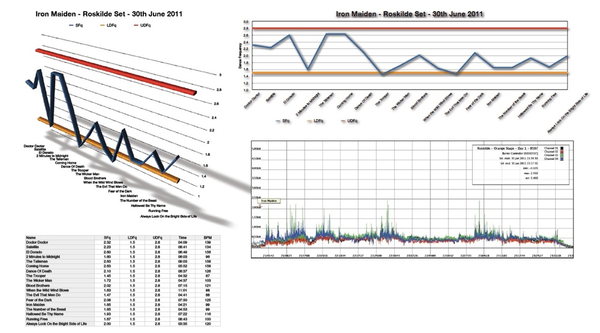 In the modelling tool we can increase the rake angle (slope) and add/remove barriers (front of crowd) to test the effects of a�progressive crowd�collapse. Although a relatively crude modelling tool this help assess the nature and dynamics of risk of progressive crowd collapse due to persistent standing in seated areas. 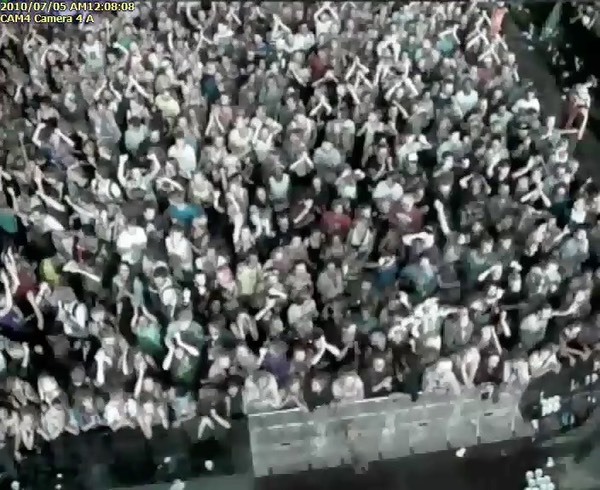 Below - design screen (green triangles are the virtual camera's - we can observe the crowd from multiple angles and experiment with progressive crowd collapse in both static and moving crowds. Below - the output from the enhanced physics crowd modelling tool. 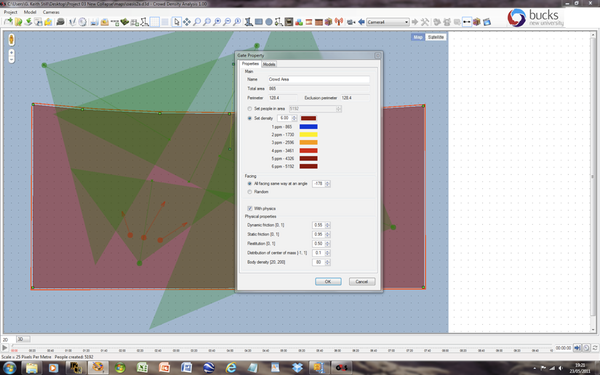 Using this tool we can test barrier design, layout/configuration and the ingress packing density. How the crowds fill the front of stage (over time and space) and behaves can be tested for new and novel barrier design/configurations. 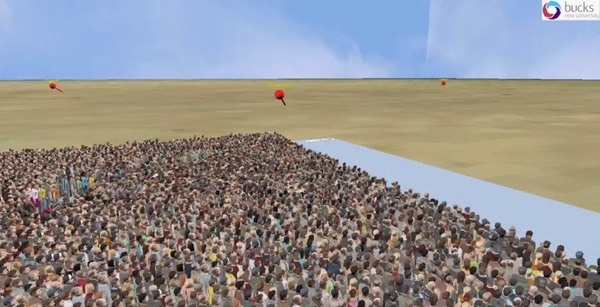 Below - video image of the types of crowd packing and excitation/lunge we can test in virtual environments. Above and below - a concert excitation and pressure analysis. We have been correlating beat frequencies, barrier pressures and pressure differentials within the crowd. Click here for more information. One of the key elements of�crowd modelling�is to understand the capacity of the space, how quickly it will fill and what time it will take to reach critical density. This does not need complex�computer simulations as simple first pass capacity�analysis gives us clear indications whether a system will work (or needs a radical design change). “Crowd forces can reach levels that almost impossible to resist or control. Virtually all crowd deaths are due to compressive asphyxia and not the "trampling" reported by the news media. Evidence of bent steel railings after several fatal crowd incidents show that forces of more than 4500 N (1,000 lbs.) occurred. Forces are due to pushing, and the domino effect of people leaning against each other. is from�Patellofemoral Joint Fracture Load Prediction using Physical and Pathalogical Parametres” Proceedings of the 1998 SAE International Congress and Exposition. SAE 980358 by PJ Atkinson, CM Mackenzie and RC Haunt. Prediction of Human Crowd Pressures (Ris S.C. Lee, Roger Hughes) Accident Analysis and Prevention 2006 Elsevier. Is a collection of the above on one paper.